Logan • When he was an assistant coach at Colorado State, scouting the rest of the Mountain West Conference, Craig Smith first took notice of Utah State basketball. Nearly a decade later, Smith is now responsible for bringing that feeling back to Cache Valley. 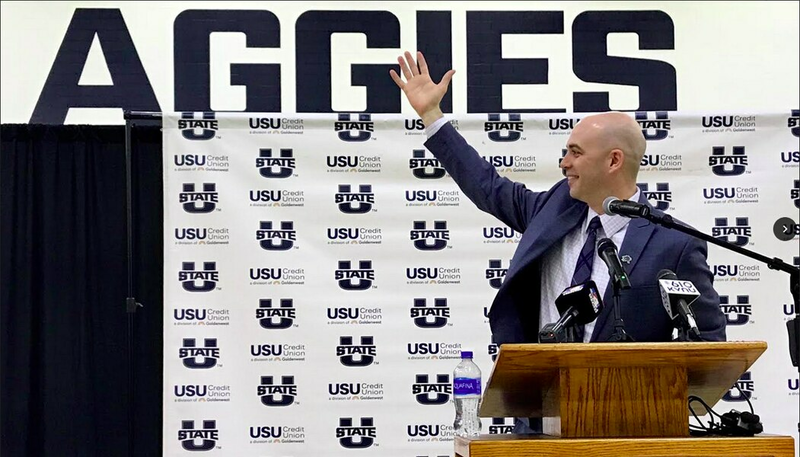 On Tuesday, Utah State introduced the über-enthusiastic Minnesotan as its new men’s basketball coach, during a news conference high on energy and heavy on promises of a return to the program’s glory days. Middling performances in the Mountain West conference, falling season-ticket sales and “fan apathy” led Hartwell to fire coach Tim Duryea earlier this month. After two weeks of searching, including meetings with seven potential coaching candidates, Hartwell said he knew Smith was the right person for USU. “There was just an instant chemistry there,” Hartwell said. With a pep band, mascot and cheerleaders hyping his arrival in Logan — and bleachers filled with university fans and boosters — Smith said he welcomed the pressure of reviving a program that has stagnated. Smith’s experience in college basketball spans over 22 years. In addition to assistant coaching jobs at Colorado State and Nebraska, Smith has led rebuilds of Mayville State, an NAIA school in North Dakota, and most recently the University of South Dakota. At Hartwell’s first meeting with Smith last week in Chicago, the coach came prepared with a binder mapping out his plan of attack in Logan. Hartwell and Smith also spent more than 30 minutes going over Xs and Os on a whiteboard in the interview room. Smith said he plans to play uptempo style of basketball in Logan. Smith has yet to finalize his coaching staff, but has already begun holding individual meetings with his players. On Thursday, star guard Sam Merrill said the uncertainty of the past few weeks have been difficult on the Aggies but Merrill and his teammates feel good about Smith’s hire. Smith, as ever, is excited about the future too. He and his family arrived in Cache Valley on Sunday to tour the campus and its athletic facilities before finalizing his contract. Inside the Spectrum, Smith said, he knew he was in the right place.